116 MMS March 2017 mmsonline.com TOOLING AND WORKHOLDING Typically, this is a two-step process. First, the upper skin and honeycomb section must be penetrated before the tool interpolates to create a hole in the correct insert size. Then, the panel is manually removed from the machine table for a manual undercut operation. In contrast, the Decoring Cut features an end-tooth design that can cut through the top skin precisely and without delamination. After the plunging operation, the tool interpolates to undercut the skins as deep as necessary to meet aerospace industry norms. A diamond-shaped tooth design ensures the removal and pulverization of the material without "pushback," the company says. The end result is reduced time for core removal, tool changeout and machining; reduced risk of error and defects; and reduced labor costs. Controx Neuhauser, call 800-558-8966 or visit neuhaeuser-controx.de. 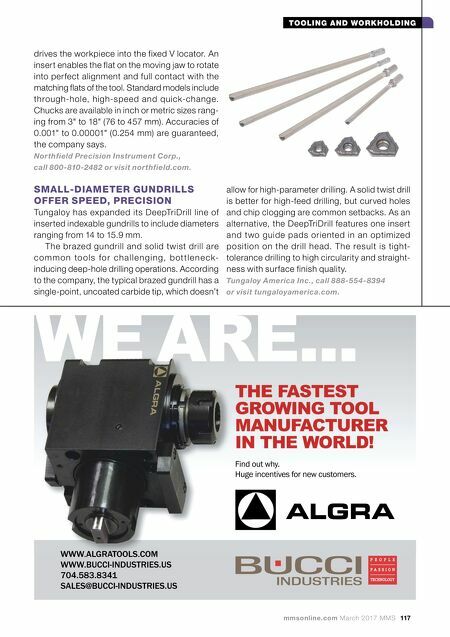 CUSTOM WORKHOLDING CHUCK USES ONE JAW Not all chucks from Northfield Precision Instru- ment are off the shelf. 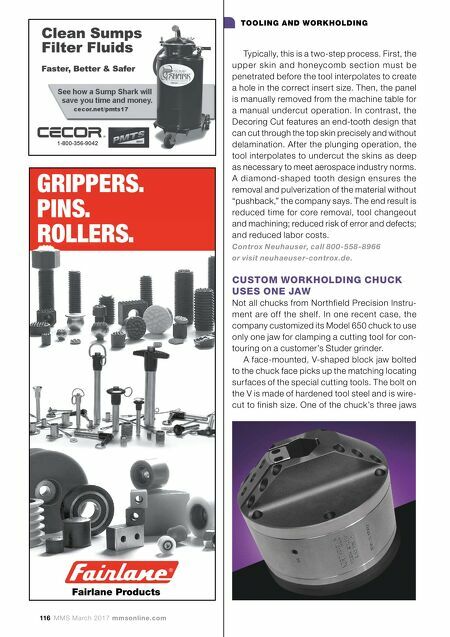 In one recent case, the company customized its Model 650 chuck to use only one jaw for clamping a cutting tool for con- touring on a customer's Studer grinder. A face-mounted, V-shaped block jaw bolted to the chuck face picks up the matching locating surfaces of the special cutting tools. The bolt on the V is made of hardened tool steel and is wire- cut to finish size. One of the chuck's three jaws GRIPPERS. PINS. ROLLERS. ROLLERS.